Love that video and the memories. Insight is spot on, I really miss being able to attend matches at home. It is the same Mike Okinyi who has made his life’s call to demonise Gor Mahia at every opportunity. Although I condemn hooliganism, I think it has been overplayed in the media. How many times have Gor Mahia fans engaged in hooliganism in the last three seasons? I dont have count but it cannot be more than three times yet it is the story the likes of Okinyi keep on harping. The media and soccer fraternity need to treat Gor with equality, good example being that when a Gor Mahia fan stormed the pitch to assault the referee(which was the main crime as the fans in the stands did not do much damage, all they did was protest ), we got docked 3 points, AFC fans invade the pitch and assault Matasi, they are fined a paltry 200,000 bob. Why the different treatment? 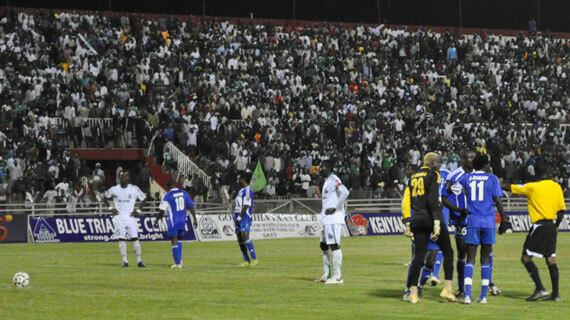 The moment Gor starts playing beautiful football, the fans will come back. Last season the stadium recorded 60-70% capacity attendance for most of our matches. Ask yourselves why and that exactly is what the EC and TB need to do to bring the stadium back to life. As for me and my house , I will continue attending even if I remain the last man standing!! Exactly why the double standards of not docking AFC 3 points when a precedent had been set twice. Infact Tusker vs GMFC scenario mirrors the Rangers vs AFC one exactly. But note FKF/IDCC dilly dallied until GMFC exhausted all appeals channels b4 favouring AFC who suffer nothing even if they are docked. EC SHOULD ACCEPT THIS AND MUST TAKE DRASTIC ACTION. THOSE 3 POINTS HAVE A HUGE BEARING ON WHO BECOMES 2016 CHAMPS. Even CAF did not dock points from Harambee Stars for crowd trouble, it only fined them. Since coaches can report clubs to FIFA can’t EC take up the matter with CAF/FIFA. Then you question the timing of the decision just when we’ve narrowed the gap to 2 points. EC get ready to take the matter to court and get an injunction against Tusker being declared league winners should those 3 points become a deciding factor. @musymo..okinyi reports as an impartial fan though he is an ardent Gor fan and we all know that.Let him do his job without necessarily taking sides. I however agree with this article.We need to bring fans back to the stadium especially for the remaining matches.The proposed measures will greatly help!! After the Tusker fiasco, Okinyi is on record saying Gor should be docked 6 points instead of 3!! Is that what you call impartial reporting Mr Oswozo? @Musymo who knows, Okinyi may be eyeing some job with Supersport. Lakini atafute kazi pole pole . He should not ride on our back. I remain forever optimistic however not sure lowering gate prices will attract fans . We are quick to forget that half of the fans in the stadium don’t pay gate charges in the first place (corruption) and most importantly, even when the matches are free ( I can count a number of them this year ) we still dont pull the crowds as expected. Here is my 3 pinpoint suggestion. 2. Play attractive football. It is no surprise that this year has been the lowest in terms of goals scored by Kogallo. if we are not scoring, our games become predictable and simply put, fans dont like predictable games…its like watching a match which you already know the final score. So the EC , TB and players must play their part and give us descent matches with descent scorelines reminiscent of yester years. 3. Make the upcoming EFUSI vs Gor Mahia match free entry – no charge. Lets get sportpesa to sponsor the dery. How is that ? This two clubs combined have over 2 million fans based spread over the country. Surely, can we put up a commercialplan within the next two -three weeks that can bring sportpesa sponsored derby back to life. Am sure Sportpesa can help with that marketing and communication strategy since they have vested interest . I am willing to work with all ‘stakeholders’ to deliver the trophy in 2016. Security and safety in the stadiums begins with us the fans. Just because AFC were not docked doesn’t mean that our reaction in that tusker match was o.k. Infact if we loose this league by a margin of one or two points, then we will have to blame ourselves (fans) for costing the team the 3 crucial points. The players and the coach will have done their part. So let us all say NO to hooliganism and fans will fill the stadiums. Full stop. Exactly, no matter how much you want to use GMFC or the Green Army as an example to fight hooliganism IDCC MUST maintain consistency in its decisions. Here both culprits committed similar mistakes, were brought before the same judge, the penalties must be the same.Despite my initial reservations I think the Rangers/AFC and CAF decisions should be the basis of filing a legal case (FIFA/CAF statutes not withstanding) should brewkenge UNFAIRLY win the league based on the docked 3 points. EC KAZI KWENU ITS A FALLBACK PLAN. INFACT BREWKENGE SHOULD KNOW WE ARE LEADING BY 1 POINT. YOU LIE ON YOUR STOMACH AND ACCEPT DISCRIMINATORY AND CORRUPT DECISIONS ONLY IF YOU’RE WEAK AND HELPLESS. IS GMFC OR OUR EC WEAK AND HELPLESS? Wapeleke hiyo upuuzi kwao. Na kuna watu hapa ambao kuandika kwao tu ni kuongea about fans. They are ever referring to the beloved fans as goons. I have said it and I will repeat, we don’ t care about the self proclaimed Gor Mahia first class fans or is it the elite fans. I belong to the crude category of fans. Sasa hata mkiandika the whole dictionary here about hooliganism, it is an exercise in futility. And i tend to think that most of the bloggers with such ideas religiously belong to sofa set branch. That is why they brand the gor fans as hooligans. @ Comrade Musyimo, first I was not directly replying to your post. Was just giving my opinion. Secondly, what we are trying to put across here is that we should not concentrate on what was done or not done to Shemejis coz it won’t help us. For example had AFC also been docked points how would that have helped our beloved kogallo. “We are not even playing in the same league with them”. So crying over why ingwe was not docked points is like crying over spilled milk. We have no control over that now. @ Musyimo, one time some years back i was in a stadium watching and supporting kogallo my beloved club play. When chaos started erupting, I tried to desuade a group of fellow kogallo supporters from throwing missiles into the pitch. They almost rained blows on me claiming I was not a true fan of kogallo. It didn’t end there. The situation got worse. The match was stopped. On our way from the stadium, rioting brothers in kogallo crashed my windscreen! From that day I became a sofaset fan. 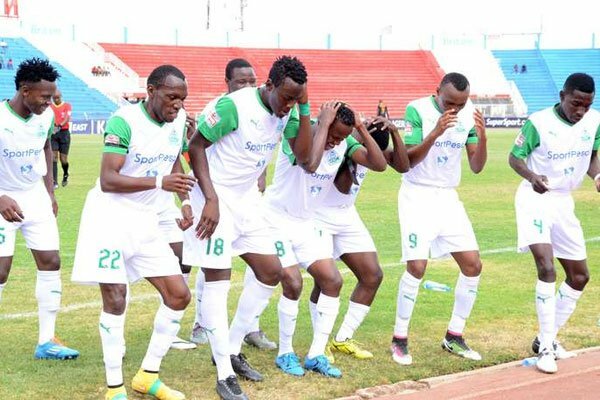 We are crying as to why Gor Mahia was docked 3 points while AFC was only fined. Similarly H/stars was not docked points but only fined. We are accussed of the same offence like AFC & H/stars so we should be fined and not docked 3 points. Now add back 3 points to our points tally and then review the league standings to see how the decision impacts (not helps we don’t need help) on us. Pole about your windscreen. I also believe that all teams must be treated equally. Selective justice is the reason fans become agitated. May I add when Posta Rangers was the victim of a discriminatory and conflicting decision, they complained and said that the player they fielded cannot be ineligible while our own GMFC player (Odula I think) signed following the same proceedure was legit. As a result P.Ranger was reinstated back to the GorTv. You don’t just fold your arms and sigh, oh! am unlucky and they are lucky. consider widespread Gotv that nowadays broadcasts the local league # ss9e. Sofaset branch has decided to sit back, relax and enjoy from the comfort of their homes. I don’t agree with bloggers who are still blaming the fans for the 3 points. How many points have we dropped after that? After all has been said about how to bring back the fans, We should not forget the aspect of accountability with regards to gate collections. Some fans are very convinced that some Ec members print their own tickets. For that reason hata mimi nikipata wamefungua gate kwa nguvu, nitaingia tu. What do I care about. The crazy linesman naye angechapwa zaidi. No matter how much some bloggers are acting as holier than though here, I don’t think the fan behavior worldwide is influenced by such writings. Now over to the yes team, one of the goons has spoken. It is time for counter attacks. Sure @Ja’Asego. Thank you for acknowledging our mighty fans. Let them leave fans alone. Nasoma nyinyi nasoma nyinyi alafu nasanga na watu ingine. Kame we naogopa tu kitu yoyote ndogo natokea huko pap. Plis ka nymbani aangalia bol na bibi na watoto yako. Kwa sababu presa yako tapanda bure. Sisi hapana chokosanga mutu.